Hand / finger trapped caught Crushed in door injury claim? How Much Compensation Can I Claim? If you have suffered a finger injury at work, in public or as a child that wasn’t your fault then you may be entitled to claim for compensation for your injury. An injury to your finger, from a finger caught in door to an amputation, can leave you with life-long pain and it can even affect how well you can use your hand for the rest of your life. One of the most common causes of finger injuries is having them trapped or crushed in a door or hinge. Crushing injuries can lead to broken bones, damaged joints and ligaments or potentially cause part or all of the finger to be severed. Legal Expert can help you begin a no win, no fee finger injury claim so that you can claim monetary compensation if your hand has been damaged in an accident that was not your fault. Compensation can help to fund treatment and cope with any loss of earnings you may have suffered as a result of your injury. My child’s fingers were crushed in a school door – can I make a claim? A colleague crushed my fingers in a door at work – is it possible to claim? A shop door crushed my fingers – can I launch a claim? What kinds of compensation am I eligible for when making a finger crush claim? How much is my finger crush injury compensation likely to be? Legal Expert – why are we the perfect service for your finger crush compensation claim? Ready to get started on a finger crush injury compensation claim? This article serves to give you all the information you will need to know about what type of finger injuries you can claim compensation for and how much you are likely to receive in compensation. Crushing injuries from fingers being trapped in a door or hinge are the most common type of finger injuries and it can cause long-lasting damage. If you have suffered a trapped door do to an act of criminal violence such as an assault. In these cases, it could be ascertained that someone else was legally responsible for the cause of the accident and it is on this basis that a claim for compensation could be made. The amount of compensation you are likely to receive will depend on the type of injury you have sustained and any other damages you may be entitled to. We will discuss the amounts of compensation you may be able to look forward to further down this guide. My fingers were caught in the door- can I make a claim? Having your fingers trapped in a door frame or hinge is a very painful experience. Once the finger has been freed you may have been left with lasting damage to the bones, joints or tendons on your finger and hand. In that case, you may be entitled to make a claim for compensation. Your basis for a compensation claim must be that your accident was either not your fault or could have been prevented. If someone else shut a door on your finger or a door slammed shut on your finger due to the mechanisms keeping it open failing, then they are legally responsible for the injury you sustained. As the accident which caused your injury was not your fault, you have the foundations for a compensation claim for your finger injury. As with any other personal injury claim, you have three years from the date of your accident to make your finger injury compensation claim. If you leave it past those three years, then you will have missed your chance to claim for any lost earnings as a result of your finger injury as well as the injury itself. If your finger was trapped in a door as a child, or your own child has suffered a finger or hand injury as a result of it becoming trapped in a door, then the three-year time limit only comes into effect once you or the child turns 18. So essentially, you have until you or the child turn 21 in order to claim for a finger injury that happened in childhood. What should I do if I’ve suffered injuries from fingers crushed in a door? If your fingers become trapped in a door or hinge the first thing you must do it release them from the doorway as quickly as possible to try to prevent serious damage. If by having your fingers trapped in a door has broken the skin, caused a cut or severed any part of the finger then a sterile dressing or covering should be applied immediately. Put pressure on the open wound to try and stem the bleeding and hold the injured hand above heart level. You will need to seek medical attention immediately. The wound will need to be sterilized and cleaned and you may require stitches or minor surgery if part of the finger has been severed. You will need to take the severed part of the finger to the hospital with you wrapped in a clean bandage. If you are concerned that you have suffered a broken finger as a result of having your fingers trapped in a doorway then the advice is similar. Release the pressure immediately and avoid trying to move the affected finger as much as possible. You can try securing it to the finger next to it with tape from the first aid kit or you can make your own splint using a pen or other straight object. Keep the affected finger raised above your heart level and holding ice wrapped in a towel gently to the finger will help to reduce pain and swelling. If you have suffered an open fracture, where the broken bone is protruding from the skin, you should cover the open wound with a sterile dressing and apply pressure to reduce the bleeding. You should seek medical attention at the hospital as soon as possible where your finger will be x-rayed, and a splint applied if needed and any open wound will be dressed. Once your injury has been treated initially, you may be required to attend follow up appointments to monitor your recovery and potentially attend physiotherapy if your injury means that you lose certain functions or strength in your hand. In order to help your finger crush door claims, you should take photos of the doorway where your injury occurred and photos of your injury, if you are able. You should also get copies of any medical reports on your injury, both from and A&E visits and further follow up appointments you may be required to attend, depending on the severity of your accident. All this evidence will help your solicitor to put together your compensation claim when the time comes. My child’s fingers were crushed in a school door- can I make a claim? When your children are at school, the school have a legal responsibility to ensure that they are cared for and kept safe from harm. Accidents shouldn’t happen as the school should have policies in place to prevent the pupils from coming to any harm. Therefore, if your child has suffered a finger injury from their hand becoming trapped in a door at school then you can claim for compensation. The school have a duty of care to your child and you can begin a cut finger compensation claim, or a claim for crushed finger injuries, on your child’s behalf. The period you have to claim is extended for children’s injuries and so you have until the child turns 21 to make a compensation claim. This means either you can claim on their behalf, or the child can start their own claim for compensation as an adult. A colleague crushed my fingers in a door at work- is it possible to claim? Suffering a finger injury at work that wasn’t your fault is the basis for many compensation claims. If a work colleague has shut a door on your fingers or trapped your hand in a door hinge, then that accident cannot be deemed your fault. Even if your colleague did not intentionally mean to crush your fingers, you can still make a claim for compensation for a broken finger at work as your employer should have safety policies in place to prevent this type of accident. However, if your colleague intentionally crushed your fingers in a door whilst at work, you can still make a claim for compensation as this now falls under the category of criminal violence. You can still make a claim, but it will be against your colleague rather than your employer. Trapping your fingers in a door may not sound like a very serious accident but it can actually result in some awful long-term consequences. Initial crushing injuries can result in broken bones which will take several months to heal properly. As the hands and fingers are almost in constant motion, setting a broken bone in a finger perfectly straight is nearly impossible. A broken bone which does not mend perfectly can cause long-term problems such as decreased mobility and decreased range of motion. You may also experience pain in the injured finger which may be seasonal or constant, depending on the extent of the injury. Many people who have suffered broken fingers from crushing also report a loss of strength in their hand and their grip, even once the injury has healed. Crushing injuries from doors can also caused cuts and open wounds. In severe cases, parts of the finger can become severed when trapped in a door or hinge. Sometimes the severed part of the finger can be reattached if medical attention is sought quickly enough and if it is possible to reconnect the tissue. Even if the tip of the finger can be reattached, people may suffer loss of sensation in the finger tip as well as decreased movement in the affected finger. Often, severed finger tips cannot be reattached and the injured party will have to suffer a deformed finger for life. Depending on how much of the finger was lost, this could have varied long term effects including pain, loss of strength in the hand and sometimes depression as a result of the injury. If a finger becomes crushed in a door and the pressure cannot be released immediately, then blood circulation to the finger can be affected. In some accidents, the doors become stuck and the injured party has their finger crushed for a substantial period of time during which their finger is not receiving any blood flow. This can cause irreparable damage to the finger causing the tissue to die. In extreme cases such as this, the affected finger may need to be amputated if the tissue cannot be saved. Other crushing injuries can include damage to finger joint and the ligaments which run through the finger. A crushed joint may heal in a manner of different way, all of which are likely to cause the injured party pain and discomfort as well as reduced movement. Knuckles may become stiff or frozen resulting in the loss of use of that finger. Damaged ligaments can be extremely painful and also result in loss of movements and functionality of the finger. In almost all cases of finger injury, there are likely to be consequences that are felt for a long time by the injured part. Many finger injuries will need surgery and physio in order to regain close to full movement and strength in the finger and hand. This can cause people to miss time from work and suffer a loss of earnings. A successful claim for compensation following a finger injury at work can give you the money you need to pay for the best medical treatment and it can also ease any financial worries caused by the loss of earnings. If you have suffered an injury to your finger following them being caught or crushed in a shop door then you should be entitled to begin a claim for compensation. The shop and owner have a duty to ensure that their doors are safe for use by the public. They should have anti-slam mechanisms to ensure they do not shut unexpectedly and so if one of their doors have slammed shut on your fingers then you have the right to begin a claim for compensation. All shops should have their own public liability insurance and that insurer will be the one who pays out any compensation you are awarded. Therefore, no matter how big or small the shop or franchise is, you can still make a claim in the knowledge that any compensation you are awarded will be paid out. Finger injury compensation amounts claimed for by those who have suffered a crush injury that was not their fault do depend on individual circumstance and the severity of the injury. You can include several different aspects in your compensation claim to cover a range of costs you may have incurred as a result of the accident and injury. The first thing you can make a claim for it the injury itself. Usually, the more severe the injury the more compensation is likely to be paid out. You can also make a claim for any medical costs you incur as a result of the injury. For example, if the injury has meant that you need to seek the help of a private specialist in order for you to regain full movement and strength in your hand. If you seek private medical care when you could have been cared for on the NHS, then you may include it in your claim, but it may not always be paid out as it will be seen as your choice. Lost tip of finger compensation may also be paid if you have had to pay to have surgical reconstruction on your finger following the accident. You may also include any other costs incurred as a result of the accident for medical treatment. If the accident was traumatizing and you have since had to pay for counselling or psychotherapy as a result, you may also include these costs in your claim for compensation. A common kind of compensation claimed for after a finger crush accident is loss of earnings. If you have been forced to have time off work as a result of the accident and therefore, not been paid, you can claim monetary compensation as a result. Crushed fingers often take a long time to heal and you may find yourself with no more paid sick days. Financial strain caused by accidents at work is common and so you can claim this loss of earnings in your compensation suit. How much is my finger crush compensation likely to be? As previously mentioned, every accident, injury and recovery is different. The amount of compensation you are likely to receive from a successful compensation claim will depend on a range of factors that you will include in your hand injury compensation amount. The most severe injuries and longest recovery times will usually result in a higher amount of compensation being awarded. While there is no definitive answer to how much is a finger worth in compensation, there are ball park figures that may give you a slightly better idea of how much your finger crush claim is likely to be worth. There is quite a lot of scope when it comes to how much your claim for compensation might be worth. For a more accurate estimate of how much you can expect to receive in a successful compensation claim, why not take a look at the table below to give a clearer picture of your potential compensation amount. Some people are put off trying to claim compensation for finger injuries as they are unsure of whether or not they have a case and the possibility of being left with a large legal bill should their claim be unsuccessful. The thought of any additional costs on top of costs incurred through their injury and the financial strain of any loss of earnings puts many people off even trying to gain the compensation which is so rightfully theirs. Claiming compensation on a no win, no fee basis means that there are no financial elements to worry about. Should your claim be unsuccessful then you won’t have to pay a penny. That’s it. There is nothing to pay if you do not receive any compensation for your accident. If your claim is successful, then often your solicitor’s legal fees will be recovered from the defendant or from your compensation amount before you receive your final payout. The amount that your solicitor receives is usually agreed as a percentage before your claim is submitted so you are fully aware of how your solicitor will be paid. Essentially this means that you have nothing to lose by submitting a claim for compensation. If you are not successful, then you walk away not out of pocket at all. If you are successful however, you could greatly ease the financial burden the injury has caused you. It’s a win-win situation. Legal Expert- why are we the perfect service for your finger crush compensation claim? Legal Expert can connect you to an experienced and highly qualified solicitor who specialized in finger crush injuries. Having someone in your corner who understands your injury in depth and has years of experience winning compensation amounts for clients in a similar position can greatly affect the outcome of your case. Legal Expert operate on a no win, no fee basis and so you can be assured that there are no hidden fees or costs you need to worry about. If we are not successful in winning you a monetary compensation amount, then we will not charge you a penny. Your dedicated solicitor will discuss with you how their fees will be collected if your claim is awarded and will openly tell you how much of a percentage of your award amount will be taken in fees. We never ask for any upfront fees either. Unlike some other companies, we do not try to hide anything from you, so you can be assured that you are working with a team you can trust. Legal Expert have years of experience helping our clients access compensation amounts for injuries and accidents that are not their fault. Our panel of experienced solicitors are on hand to answer any and all of your questions and will be by your side every step of the way as you claim for compensation after a finger injury. 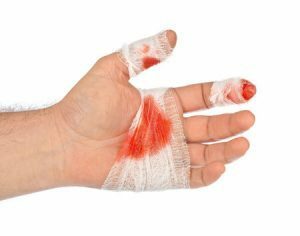 If you are ready to begin a claim for cut finger at work compensation or a claim for any other crush injury you have sustained to your fingers, then get in touch with Legal Expert today. We can get the ball rolling and ensure that you receive the compensation you are entitled to for your injury. Call us today and speak to one of our team on 0800 073 8804 who can help you begin the process of starting your claim for compensation and also put you in touch with one of our dedicated panel solicitor who will be handling your case. If you need more information or would like one of our team to contact you then feel free to fill out a contact form. How Much Compensation For A Finger Injury? Find out how much compensation you can claim for a finger injury calculate the compensation amounts. Calculate the compensation amounts for a hand injury claim. If you go through this checker you may be able to get an idea of the type of injury you have suffered.